SHIRLEY Strickland’s a champion – not to be confused with the hurdler Shirley Strickland who won Olympic gold for Australia in Helsinki in 1952 and Melbourne in 1956. But she’s a true champion for hundreds of children she’s met in Religious Instruction classes at Albany Hills State School at Albany Creek, north of Brisbane, over more than 20 years. 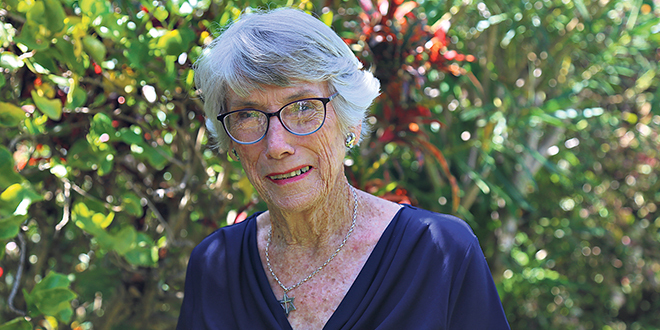 Carole Danby, a project officer with Evangelisation Brisbane who guides and supports RI programs in state schools throughout Brisbane archdiocese, describes Shirley as a “dynamic” 83-year-old who’s been instrumental in keeping the ministry going in Albany Creek for two decades. She’s sad that Shirley’s finishing up this year but pleased she’s so dedicated she’s made sure the right people are in place to continue the good work at Albany Hills. Shirley knows it’s time to step down, partly because of her age but also because it’s the right time to hand over with the right people ready to take over. Talking of age, she laughed at a reminder she had of that only two weeks ago when someone heard her name and thought of the champion athlete. “I said, ‘Yeah, I used to run in a club she was in and got a trophy …’,” said the retired catechist, who, like the Olympic champion, used to live in Western Australia. Looking back to when she first heard Mrs Danby recruiting volunteer RI teachers in Albany Creek parish, Shirley said she was a bit “silly” that day. “Carole came out to talk to us at the parish and I walked up to her afterwards and I said, ‘Look, I’m really interested in this. But I’m far too busy …,” she said. And now, as she steps down, she wouldn’t have missed the experience for anything. Once Shirley had started as a catechist, it wasn’t long before she was co-ordinating the team of RI teachers at Albany Hills, including volunteers from other denominations. Those who had been in the role moved on and Shirley saw the need. “I thought, ‘Well, if we want to keep it going …’ and that’s how I ended up taking over and it just sort of flowed from there,” she said. And Shirley said for anyone thinking of volunteering for RI, she would recommend they give it a go. “It will be one of the best things you’ll ever do – one of the best things you’ll ever, ever do,” she said. “And you’re not alone; there’s always someone to help you. “With the way the (political) climate is, will religion be here in classrooms in the future? That’s the big challenge. Shirley said teaching RI gave great self-fulfilment, “which is probably very selfish”. “And, for once in your life, you’ll think you’ve made a difference,” she said. “You never ever know if you’ve made a difference, even raising your kids, do you?” she laughs. Shirley’s found that “the kids’ spirituality’s amazing, absolutely amazing”. “They come out with things that we often wouldn’t even think of,” she said. “And all the teachers tell you this. They say, ‘the spirituality’s there; it just needs someone to talk about it’. Shirley said the children would confide in their RI teacher. “Children trust … They have a confidence in you … (they’ll tell you) things they don’t tell the class teacher,” she said. Why that was, Shirley said, she was unsure. “We’re probably talking love. I’m guessing … I have no idea,” she said. Shirley’s also learned that the children are completely honest in ways unexpected. “I say to (the catechists), ‘Wear a crucifix, a cross … If you can, if you’ve got one, wear one into the classroom – these kids never see them. They wouldn’t have a clue what it is’,” she said. “So my friend, who’s got a magnificent, crystal, huge, beautiful cross, (took the advice). “And (my friend) said to me, ‘Deflated’,” Shirley laughs. “A little bit, but no, I think I’ve run the race, at this stage,” she said. “I think I’ve run the race, done all that’s had to be done, left it in good shape – which is terribly important. Shirley said she was leaving “a great team, great team”.